Douglas Snelling has been welcomed posthumously by architects and historians in Honolulu, where he holidayed and lived from the 1960s until his death in 1985. The Hawai‘i chapter of Docomomo, the international modern architecture preservation group, recently hosted a lecture on Snelling's pan-Pacific career, presented by his biographer, Davina Jackson, with personal recollections by Snelling's third wife, Marianne Sparre. Held at the offices of architects WCIT, the event was organised by Hawai‘i's most distinguished architectural historian, Don Hibbard (author of Buildings of Hawai‘i and other key surveys), and Professor Martin Despang of the Architecture School at the University of Hawai‘i at Manoa. Snelling did not create any building in Hawai‘i, apart from renovations to one of his homes there, which had been designed originally by his friend, eminent Honolulu architect Vladimir Ossipoff (1907–1988). 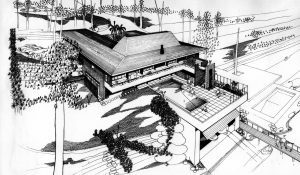 However Don Hibbard and architect John Williams noted that several of Snelling's mid-1960s concepts for Sydney houses included a double-pitched hip roof style which is commonly known in Hawai‘i as 'the Dickey roof'. Named after Maui-born architect Charles William Dickey (1871–1942), who designed notable residences around Hawai‘i during the late 1920s and early 1930s, this style of roof includes a steeply pitched and tapered rectangular central zone flaring to a shallow-pitched outer zone, extending to wide eaves shading all walls. It is believed Dickey was inspired originally by Hawai‘ian king Kamehameha V's thatched-roof cottage at Waikiki Beach. 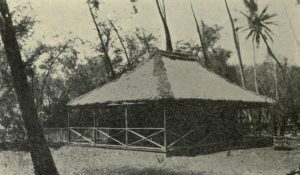 Kamehameha V's 19th century beach cottage at Waikiki. 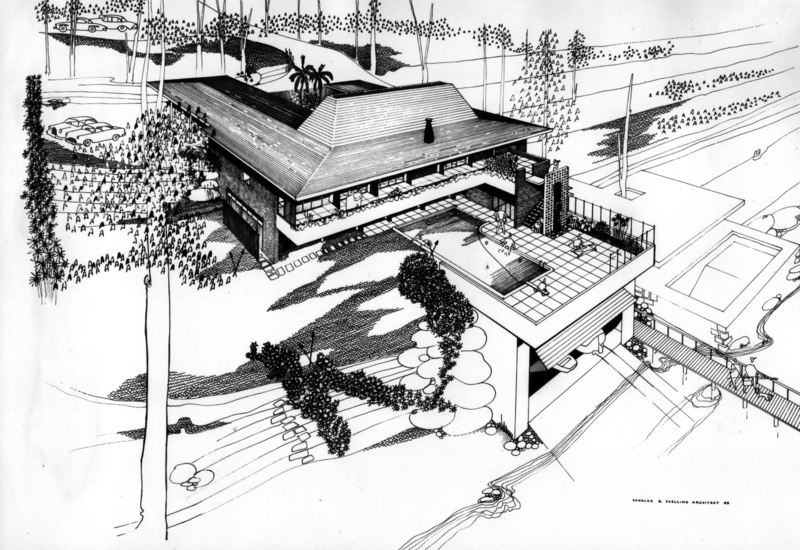 Snelling's Dickey roof for the unbuilt Bowes house. Snelling's unbuilt scheme for the Bowes house at Clareville Beach was his most direct design for a Dickey roof, but he also created other versions of 'islander'-style roofs, for the Kelly House II at Vaucluse and Arthur F. Little house at Clareville Beach. These projects were all designed in the several years after Snelling's first visit to Hawai‘i in 1963 (after his earlier houses with flat roofs), and were exemplars of his third stylistic phase for residential architecture, which Jackson has described as his 'Fantasy' or 'Ethnic' period.